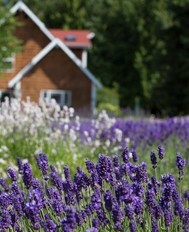 Explore our Sequim lavender farm, wedding venue, vacation rental, u-pick lavender and certified organic lavender products. PURPLE HAZE LAVENDER Farm is a 7 acre certified organic lavender farm located in Sequim on Washington’s Olympic Peninsula. At Purple Haze in the summer we welcome you to wander our lavender fields, enjoy a scoop of lavender ice cream, and shop in either of our two stores-one of which is located on the farm itself and the other one which is located in downtown Sequim at 127 W Washington Street. During our “winter” months only our Downtown gift shop location remains open. However, we always welcome visitors to enjoy the farm and then if you wish to shop just stop at our store downtown and we will be happy to help you with your lavender purchases. Our store in Downtown Sequim is OPEN year round Monday-Friday 9-5, Saturday 10-5 and Sundays 12-4. Pets are always welcome at the farm! Experience Purple Haze Lavender as our guest in the Farm House Vacation Rental. The Farm House has 3 bedrooms and sleeps up to 6 guests. 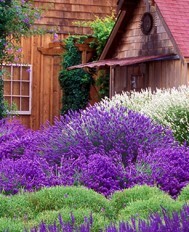 Take in the farm from the hot tub or porch swing, and relax into your own personal lavender farm setting. The Farm not only hosts many wonderful Sequim lavender events throughout the year, including Purple Haze Daze during the Lavender Weekend in July, but it is also a breathtaking Sequim outdoor wedding venue. Our beautiful gardens, manicured lawns, and ponds create a complete wedding setting. The Farm House is perfect for you and your bridal party to prepare for the wedding, as well as a romantic stay for the beginning of your honeymoon. 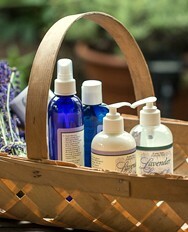 We invite you to experience our Sequim lavender… here and at home! Whatever brings you to Sequim and the Olympic Peninsula, be sure to take some time out of your travels for an unforgettable visit to the Purple Haze Lavender Farm. If you’re unable to stop by in person, you can still experience Purple Haze via our webcam and by shopping in our online store for the complete line of Purple Haze culinary, body care, certified organic lavender products, lavender plants, and bulk lavender.